Hepatolithiasis is defined as calculi in the biliary ducts proximal to the joining of the right and left hepatic ducts regardless of the presence of concurrent gallstones in either the gall bladder or common bile duct. Its prevalence reaches 30%–50% in East Asia. 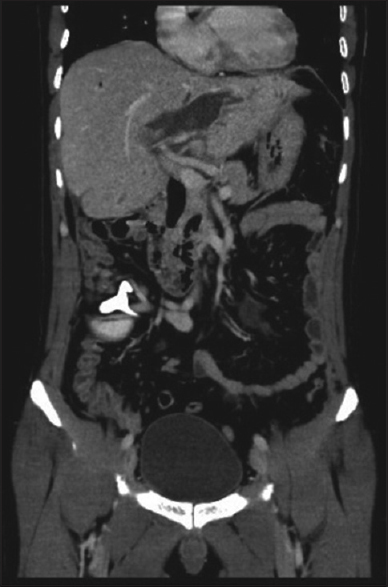 A 43-year-old Bengali man presented to the emergency department with right upper quadrant abdominal pain, fever, chills and jaundice of 2 days' duration. His surgical history revealed recurrent cholangitis, pancreatitis, liver abscess, cholecystectomy more than 10 years previously and multiple endoscopic retrograde cholangiopancreatographies (ERCPs), one of which was accompanied a sphincterotomy. On presentation, he was conscious, his temperature was 38°C and his blood pressure was 125/78 mmHg. He had scleral icterus and right upper quadrant abdominal tenderness with a positive Murphy's sign. Blood analysis revealed a white blood cell count of 19.5 × 109/l, alkaline phosphatase of 200 IU/l, total bilirubin of 3.8 mg/dl and C-reactive protein of 405 mg/l. Lipase (11.7 U/l) and alanine aminotransferase (90 U/l) were within normal limits. Computed tomography (CT) of the abdomen revealed multiple intrahepatic stones, with the largest occluding the left hepatic biliary duct and causing proximal dilation of the hepatic duct [Figure 1] and [Figure 2]. Axial precontrast image showing a hypodense stone in the left main hepatic duct with proximal dilation of the duct. Coronal precontrast image showing a hypodense stone in the left main hepatic duct with proximal dilation of the duct. The patient was admitted, and acute recurrent ascending cholangitis was diagnosed. ERCP showed proximal left hepatic duct occlusion with the proximal duct dilated and filled with pus. A stent was inserted for draining the pus. 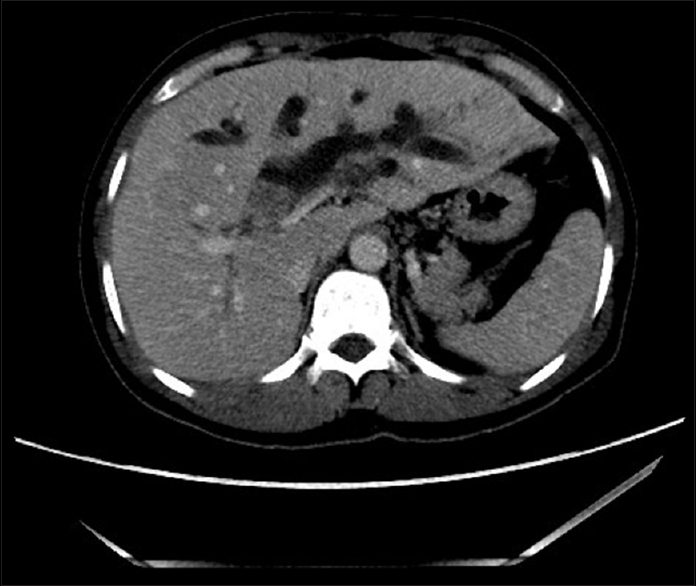 Left hepatectomy was later carried out due to the presence of multiple large stones, the location of these stones and recurrent cholangitis [Figure 3]. The post-operative period was uneventful; the patient's vital signs were stable, and he was doing well. There was no longer abdominal pain or jaundice, and he was discharged 1 week later. The resected left liver lobe with the stones extracted in the kidney dish. The aetiology of hepatic stones is suggested to be multifactorial with diet possibly playing a larger role than ethnicity. Parasitic causes have also been implicated, but the evidence is inconclusive and these causes have been suggested to be incidental. Considering that the bile of patients with hepatolithiasis has an almost 100% prevalence of bacteria as opposed to the sterile bile of patients without hepatolithiasis, bacteria have also been implicated. Most of these bacteria show β-glucuronidase activity (responsible for catalysing the hydrolysis of direct to indirect bilirubin). This unconjugated bilirubin is water-insoluble and combines with calcium bilirubinate to form calcium bilirubinate stones, which are the most prevalent type of stones in hepatolithiasis (80%). Bile stasis caused by many underlying hepatic diseases (such as sclerosing cholangitis or secondary to benign strictures) is another possible cause. This is proposed as the main cause of hepatolithiasis in the West. Stones are more common in the left lobe of the liver, and the reason for this is thought to be the merging of the left hepatic duct at an acute angle with the common bile duct, which tends to induce bile stasis in an already narrow biliary tree with strictures. The diagnosis of hepatolithiasis is multimodal and similar to the process of diagnosing choledocholithiasis or cholelithiasis. Ultrasonography, contrast-enhanced CT and magnetic resonance cholangiopancreatography may all be used. However, the gold standard for therapy and diagnosis is ERCP and percutaneous transhepatic cholangiography (PTC). Carcinoembryonic antigen levels may be checked to determine the presence of concomitant cholangiocarcinoma. To decide the approach to the surgical management of hepatolithiasis, Dong's classification system is used [Table 1]. This classifies the disease based on the location of the stones and the presence of intrahepatic bile duct strictures or hepatic parenchymal atrophy. Hepatolithiasis type Definition1 Localised stone disease as follows: unilobar or bilobar2 Diffuse stone disease2a, No atrophy of the hepatic parenchyma or stricture of the intrahepatic bile duct2b, segmental atrophy and/or stricture of the intrahepatic bile ducts2c, Biliary cirrhosis and portal hypertension additional type E extrahepatic stones. The goal of managing hepatolithiasis is to break the vicious pathophysiological circle by treating ongoing infections, preventing the recurrence of cholangitis and consequent hepatic fibrosis, reducing repeated instrumentation and preventing progression to cholangiocarcinoma. The current options for treating hepatolithiasis include nonsurgical endoscopic approaches and hepatectomy. Endoscopic management, including PTC, peroral cholangioscopy and ERCP, can be combined with extracorporeal shockwave lithotripsy – for cholesterol stones – or holmium as follows: YAG laser surgery. Although less invasive and easier to implement in most cases, a limitation to endoscopic techniques is that around 40% of patients with hepatolithiasis have strictures in the intrahepatic bile duct. This not only makes extraction of stones difficult but also does not resolve these strictures, which, in turn, causes disease recurrence. In addition, already limited access to intrahepatic stones is made more difficult by the location of these strictures, angulation of the ducts and extent of stone impaction. Newer procedures include endoscopic resection of peripheral bile duct stenoses to facilitate the evacuation of intrahepatic stones and chemical bile duct embolisation. However, as the latter technique has been successfully revealed in only two patients till date, these newer approaches need to be studied for efficacy in larger numbers. According to Öztürk et al., in patients with a high load of calculi, percutaneous intervention through a minimally dilated access tract is a safe and successful method of eliminating the stones. Until 1998, surgery was the primary method for managing hepatolithiasis; however, management has since shifted to primarily nonsurgical techniques. In 2011, 66.7% of hepatolithiasis cases were treated using non-operative approaches, with the most common procedures being ERCP and stone extraction. However, when comparing hepatectomy with percutaneous transhepatic cholangioscopic lithotripsy as management options for hepatolithiasis, hepatectomy was associated with a higher rate of survival (77%), a lower rate of bile duct strictures (18% vs. 58%) and a lower rate of recurrence of stones and/or cholangitis.,, A lower rate of recurrence is an important risk factor as the prevalence of cholangiocarcinoma increases with recurrent hepatolithiasis. Indications for surgical management include unilobar disease, fibrosis due to recurrent cholangitis, multiple abscesses, suspicion of concurrent intrahepatic cholangiocarcinoma and disease that cannot be treated endoscopically. Hepatolithiasis is a rare disease found mostly in East Asia. The gold standard for its diagnosis is ERCP and PTC, but the presence of concomitant cholangiocarcinoma adds considerable risk. Indications for its surgical management include the presence of stones in one liver lobe (especially the left lobe), multiple large stones that cannot be treated by other methods, complications secondary to cholangitis and suspected cholangiocarcinoma. Written consent was obtained from both patients for the publication of this case report and accompanying images. Feng X, Zheng S, Xia F, Ma K, Wang S, Bie P, et al. Classification and management of hepatolithiasis: A high-volume, single-center's experience. Intractable Rare Dis Res 2012;1:151-6. Sakpal SV, Babel N, Chamberlain RS. Surgical management of hepatolithiasis. HPB (Oxford) 2009;11:194-202. Kim HJ, Kim JS, Joo MK, Lee BJ, Kim JH, Yeon JE, et al. Hepatolithiasis and intrahepatic cholangiocarcinoma: A review. World J Gastroenterol 2015;21:13418-31. Park HM, Hur YH, Cho CK, Koh YS, Kim HJ, Park EK, et al. Incidence of underlying biliary neoplasm in patients after major hepatectomy for preoperative benign hepatolithiasis. Ann Hepatobiliary Pancreat Surg 2016;20:173-9. Nitin Rao AR, Chui AK. Intrahepatic stones – An etiological quagmire. Indian J Gastroenterol 2004;23:201-2. Yellin AE, Donovan AJ. Biliary lithiasis and helminthiasis. Am J Surg 1981;142:128-36. Sheen-Chen S, Chen W, Eng H, Sheen C, Chou F, Cheng Y, et al. Bacteriology and antimicrobial choice in hepatolithiasis. Am J Infect Control 2000;28:298-301. Nakayama F. Intrahepatic stones. In: Jarnagin W, editor. Blumgart's Surgery of the Liver, Biliary Tract and Pancreas. Philadelphia: Elsevier Saunders; 1994. p. 765-74. Li FY, Jiang LS, Cheng JQ, Mao H, Li N, Cheng NS, et al. Treatment of hepatolithiasis by chemical bile duct embolization: Report on 2 cases. Surg Laparosc Endosc Percutan Tech 2008;18:86-8. Öztürk A, Sönmez MG, Bakdık S, Göger YE, Özkent MS, Aksoy F, et al. New surgical technique applied with urological instruments in bilobar multiple hepatolithiasis: Ultra-mini percutaneous hepatolithotomy. Turk J Urol 2017;43:371-7. Suzuki Y, Mori T, Yokoyama M, Nakazato T, Abe N, Nakanuma Y, et al. Hepatolithiasis: Analysis of Japanese nationwide surveys over a period of 40 years. J Hepatobiliary Pancreat Sci 2014;21:617-22. Otani K, Shimizu S, Chijiiwa K, Ogawa T, Morisaki T, Sugitani A, et al. Comparison of treatments for hepatolithiasis: Hepatic resection versus cholangioscopic lithotomy. J Am Coll Surg 1999;189:177-82. Cheon YK, Cho YD, Moon JH, Lee JS, Shim CS. Evaluation of long-term results and recurrent factors after operative and nonoperative treatment for hepatolithiasis. Surgery 2009;146:843-53. Huang MH, Chen CH, Yang JC, Yang CC, Yeh YH, Chou DA, et al. 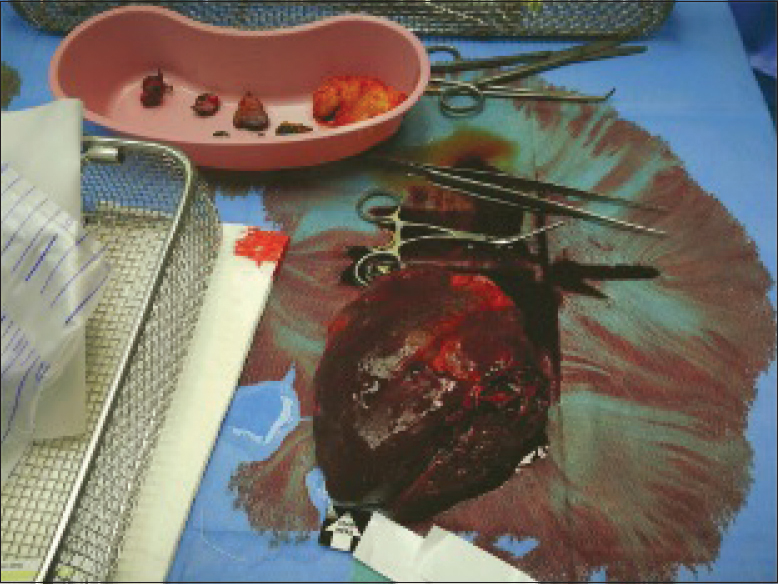 Long-term outcome of percutaneous transhepatic cholangioscopic lithotomy for hepatolithiasis. Am J Gastroenterol 2003;98:2655-62. Li C, Wen T. Surgical management of hepatolithiasis: A minireview. Intractable Rare Dis Res 2017;6:102-5.